This morning, Lisa and I went into Reno where we used up the remainder of my comp points with the Atlantis and had breakfast at the buffet. It was a good breakfast; the remodel hasn't mangled their breakfasts the way it did the dinners, and it's harder to mess up breakfasts. Not being in any hurry and with the restaurant not crowded, we lingered over breakfast. I used up the $10 that I won at the Wigwam yesterday on Keno. (I won $5 on the $10 ticket but then spent it on more tickets that didn't win, so that was that.) Trying to get the blood flowing after all of that food, we walked around the hotel, where Rotary International was having a conference. There were a bunch of people in red vests labeled "Sergeant At Arms," and I wish we'd had WSFS ones made for Joyce and her team of SAAs that made running last year's WSFS Business Meeting so much easier. As we headed out to the van, it started raining, so the one errand that would have obliged us to be outside for quite a while was scrapped. However, we took care of a bunch of other smaller errands before heading home. Lisa had been up since about 2 AM and decided to turn in very early. I listened to the Giants game (rats, let that one get away). Just before 5 PM, I went out and waved at Amtrak #6 running through on time. Within seconds of my going back inside, I heard the sound of large raindrops hitting the porch awning. Soon thereafter, it got very loud and very wet. 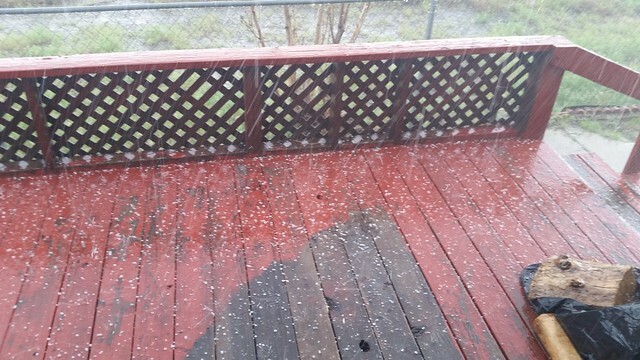 The rain turned to pea-size hail, and after a brief respite, it came back harder than ever. I switched the camera to video. Checking the weather radar, I saw a bunch of orange-to-light-red cells moving through the area. I stayed inside, glad that I'd done much of the packing of the Rolling Stone for my trip to the Bay Area for this coming week of Day Jobbe earlier after we got home. That was a pretty intense storm, although it did not last long. I'm grateful that we didn't have to be out driving in it.